The Magellan VIII xu is TBI’s newest sub. Although it looks like most of the other Magellan subs, TBI says it is a greatly enhanced design. Their website explains that their subs use a quasi-transmission line loaded enclosure that allows the woofer to “see” the same load regardless of where the enclosure is placed. The enclosure’s compact size made it easy to place. The ability to explain the technology behind TBI’s subs is well beyond me. So if you’re up to it you can read more about it on their website. The Magellan VIII xu is a passive sub and the MGD-200 is their subwoofer amplifier. You don’t have to use the two together, but I can’t see why you wouldn’t. The amp has plenty of power and is very versatile. 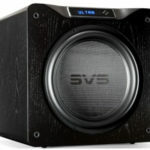 The sub itself looks quite different from most other subs: The 8″ aluminum low mass driver is entirely enclosed, and the unit has a very small footprint (17.5 inches x 17.5 inches x 8.5 inches high with its spikes), weighing only 27 pounds. I’m sure that just these specifications make you wonder about this sub’s performance. · Audience aR6-T with Au24 powerChords. Everything but the speakers and cables are sitting on a Box Furniture Company DS3 Rack. The second system was my “Digital Music and Video System”. My sources in this system are a Marantz Blu-ray player, a Direct TV high-definition satellite box, and a computer based system. All of these are plugged into a Peachtree Audio Decco Integrated Amp with built-in DAC, which powers a pair of Teresonic Magus A-55 speakers with Lowther A-55 drivers. Like all subwoofers it takes some time and trusting of your ears to get the best sound. The TBI sub does not seem nearly as sensitive to positioning in the room. This combined with the great flexibility of the MGD-200 amp and it’s a breeze to dial in. Though I do have one suggestion, if ever there was a product that needs a remote control, it’s a subwoofer’s amp. Think how easy it would be to sit in your chair and dial in a sub. By the way, while I’m wishing, if you could set the amp to remember two or even three settings that would be great. I would love to set it up differently for movies, rock, and then jazz and classical. Then just switch it when you change what you are listening to. How do they affect the sound? Voices are incredibly important to me so one of the first things I noticed was that this sub and amp had no negative effect on this sonic attribute. The next thing I noticed was the ability of the TBI duo to let the system play the beat of the music without a trace of overhang. My system with the TBI sub and amp seemed just as agile and quick as it was without it, but now with deeper and more powerful bass. It was a bass I could feel in my chest and gut. It is remarkable how clean, deep and authoritative my two systems sounded with the TBI duo, all the more so considering how small and light both the amp and sub are. The duo is deep and powerful, and I was especially impressed with their ability to keep up with my speakers at very high volumes. On most acoustic music I hardly noticed any difference, maybe a little weight to a kick drum and the lowest notes of a stand-up bass. On music with any sort of really deep or electrified bass, or especially movies, this duo made a significance difference. I should also mention that this duo disappears, irrespective of where the sub was placed. When listening to music I never felt like there was more than one sound source. I think much of this great sound is attributable to low resonances, a result of the TBI sub’s very small cabinet and internal design. Another point to be mentioned is that the port is almost completely quiet; I never heard any of the noises I typically associate with ported speakers that play really deep. I therefore believe the TBI duo is surely good enough to use with electrostatics, planars, and even ribbons. 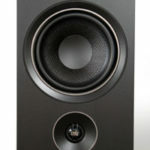 I had on hand a pair of B&W 805S that I set up in the reference system downstairs in place of the Teresonic Ingenium XRs. This was simply an amazing sound, probably the best I have ever heard any B&Ws sound. The sound was wonderfully easy to listen to, seamless, very deep, and quite powerful. It was really hard to imagine that all this sound was coming from a pair of stand mounted speakers and this little subwoofer. So all this lead me to wonder how this TBI duo would sound with my Lowthers. I’m approaching this review a little differently, for I’ve been thinking for some time that I might want to add a sub to my video/digital system. 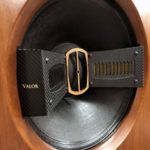 I was impressed enough with this subwoofer and subwoofer amplifier to ask the question, “Would I want to add a sub to either of my two systems?” As I said, I was pretty sure before I was contacted about this review that I might enjoy a sub in the video/digital system. At the same time I had never had any interest in a sub in my reference system, but of course I had to listen to the TBI duo in both systems. This is not my first time to use subs; I’ve had a REL Studio II, a Carver, and a Vandersteen sub. So I had some idea how subs sounded, but I was not prepared for how the TBI Magellan VIII xu and the MGD Subwoofer Amplifier would sound in my two systems. The TBI was everything I had hoped for and more in the video/digital system. Movies had more impact, and it was not hard to get it to blend with the Teresonic Magus A-55s as long as the sub wasn’t crossed over too high, and the volume on the subwoofer wasn’t turned up too loud. I would call the match for the video/digital system a complete success. As this system is in the family living area it should also be pointed out how wonderful the small footprint was. Another thing I liked with the TBI duo in the video/digital system was how easy it was to change the sound for music and movies. I preferred the subwoofer crossed over lower for music, a little higher and with the volume turned up a bit for movies. I was rather amazed at the ability of the TBI duo to keep up with the Teresonic Ingenium XRs with Lowther’s DX 4 Silver Drivers. It was possible to set the system up so that the TBI Duo did nothing negative to the sound of the Teresonics 90% of the time. The TBI obviously extended the sound down into low 20Hz region in my room. The only catch to do this without adding extra warmth or slowing down the overall sound of the system was that they had to be crossed really low, and one had to be very discrete with the volume. Then there was the 10% of the time that the TBI duo just couldn’t play loud enough or fast enough to keep up with the incredible dynamics of the bass from the Teresonics. I want to be the first to say that a lot of people would gladly give up that 10% to get the deeper bass 90% of the time. I also think that a lot of people would cross them over a little higher and be happy about the little added warmth, but those people wouldn’t own the Teresonic Ingenium XRs to start with. So for me I’m still perfectly happy with my reference system only playing down to around 35Hz, but doing so with incredible dynamics and power with the TBI. Don’t forget how great I said they sounded with the B&W 805S monitors. I think this duo from TBI will be the perfect match for many of today’s finest stand mounted speakers. The TBI Magellan VII xu Subwoofer used with the MGD-200 Subwoofer amplifier is without a doubt the finest subwoofer system I have ever had in my house, or for that matter that I have ever heard anywhere else. They are so easy to place and blend, and are such an easy size to work with. This combination means they should surely be on your short list if you are looking for a subwoofer. TBI Audio Systems would like to thank Dagogo for their honest and thorough review of our Magellan VIII xu and MGD-200 subwoofer amplifier. As stated in the review the operating principles are entirely within the diminutive Magellan VIII xu enclosure. 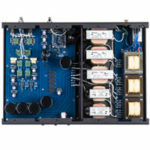 Our MGD-200 or TBI 200 su amplifiers are fine products indeed and allow for full integration with your mains. I want to emphasize, especially in this economy, that the application of other quality subwoofer amplifiers or amp/crossover combinations with our passive subwoofer line will bring proper integration results. This allows for the use of existing equipment already owned or experimentation with other or even more specialized crossovers/ processors. There is no special electronic processing required only crossover frequency and volume adjustments at minimum with adequate power. We are certainly going to look into some of the suggestions by the reviewer to include even more useful features on our next subwoofer processor/amplifier. Multiple passive units in stereo or mono subwoofer setups add additional acoustic output for larger rooms and/or higher listening levels. All TBI subwoofers received an upgrade in 2010 enhancing their acoustic impedance and power delivery.